(Virginia, 2009), x + 234 pp. Reviewed by Laurel Brake on 2009-09-01. This book deploys notions of genre formulated by Mikhail Bakhtin to analyze the mid-Victorian press and its interface with literature over a period of a dozen years (1855-1867). Explicitly rejecting the theories of "social scientists" such as Benedict Anderson, Jurgen Habermas, and Pierre Bourdieu, Liddle argues that only Bahktin's theories allow for close readings of text, a critical approach allegedly favored by English and History. Firmly located in literature, four chapters out of six treat named writers: Elizabeth Barrett Browning, Harriet Martineau, George Eliot and Anthony Trollope, exemplary figures who engage tellingly with discourses of journalism while remaining in the approved category of literature. In a fifth chapter sensation fiction is compared to sensational journalism, building on the scheme of Richard Altick's Deadly Encounters (1986). The whole is framed by a Chaucerian paradigm, with each chapter's main title alluding to a type of Tale - the Poet's, the Authoress's, the Editor's, the Reviewer's, the Clergyman's and the Scholars' with a Prologue and an Epilogue. The latter and "The Scholars' Tales" are dedicated to theoretical exegesis. The Prologue lays out Liddle's theoretical claims for an exclusively generic analysis and for his interpretation of Bakhtin, whose nuanced and productive notions of heteroglossia and dialogia are tantalisingly invoked. In the single-mindedness of his approach, eclectic criticism is rejected, a move which not only excludes any aspect of current alternative approaches, but also insists on the letter of Bakhtin's theories, products of cultural conditions in Russia of the 1920s and 1930s. Thus in the penultimate chapter Bakhtin's "dialogic imagination" is deemed inapplicable to the "genre" of journalism because Bakhtin denies dialogic properties to "extra-artistic" discourse, a monologic category that includes journalism (152-53). In the Epilogue, Liddle echoes Bahktin by categorizing journalism as "non-literary Victorian discourse" (161). Likewise, when Liddle refers to journalism's "overabundance of text problem" (153) and takes the individual article as the unit of journalism, he reveals the literary basis of his argument. In other words, literature is pervasively ranked above journalism. The claim in the Epilogue (163-65) -- that by reputation the novel is a stable form, while journalism is plagued by change -- tacitly invokes the classical aphorism ars longa, vita brevis to assess their relative worth: journalism is defined as a medium driven by editors claiming to displace their (inferior) predecessors while novelists sustain the continuity of their form. But during a period in which the novel and journalism are both attempting to establish themselves, we can find examples of just the opposite: disruption of the tradition of the novel and continuity among generations of journalists. The Dynamics of Genre is a critical narrative with a voice. The shaping intelligence of Liddle's schema is everywhere evident in its argument, and he regularly explains why he excludes and rejects other approaches. Moreover, some of the newspaper and periodical material is fresh, and Liddle's close readings of exemplary case studies--even when problematic--are always interesting. Of these, the sharpest and most resonant is his account of Trollope's role in mediating between journalism and the mid-century Victorian novel. By not only locating journalism at the heart of some of his fiction but also revealing its processes and culture, Trollope bcomes the hero of Liddle's pantheon. Also useful and provocative is the chapter on George Eliot, where the tone in two of her "slasher" reviews (see more on this below) is compared with the ethos of "sympathy" evident in her fiction. Likewise interesting is Liddle's piece on the trajectory of Martineau's career. But for me the piece is marred by its failure to understand the ubiquity (or power) of anonymity, the (high) status of leader writing, and the unique position that Martineau occupied as the only female leader writer on a national daily. In "The Poet's Tale," the evidence mustered to establish the alleged ubiquity of opinion against journalism and in favour of poetry and art is Elizabeth Barrett Browning's indictment of journalism in Aurora Leigh, bastioned by her husband Robert's in "Bishop Blougram's Apology." Their point of view is foreseeable, distanced as they were in Italy, far from the lure and fever of journalism in Britain and insulated by their mutual investment in the private life of the artist. That their views did not represent those of all poets, many of whom had a vexed if persistent relationship with journalism, has been demonstrated by Linda Hughes and Kathryn Ledbetter in recent books, articles, and lectures on poetry and the press. (See for instance Tennyson and Victorian Periodicals and Victorian Periodicals Review.) More problematic is the attempt to distinguish the genre of sensation fiction from sensational journalism, using material previously identified and treated by Richard Altick. Against numerous examples of sensation fiction supplied, just one example of sensation journalism patently does not work to distinguish the two genres with any certitude. More generally, the introduction of research and material in The Dynamics of Genre is highly selective. While current facets of newspaper and periodical studies are strikingly absent, they are displaced by theories of the 1970s and 1980s -- imagined communities, the public sphere, and the cultural field. Subject to debate over 30 years, these theories are treated as straw men, and easily cast aside. What is missing is troubling. Nowhere in this narrative, for instance, is the discourse of media history considered as an alternative analysis worthy of scrutiny. Nor are the already rich debates provoked by the various digital editions of the Victorian press now in circulation seriously considered. When electronic editions are invoked, the phrase 'blurry-eyed' is repeated three times in the same sentence (148), lest the reader miss the author's distaste for and dismissal of unbound periodical material, whether read by candlelight, microfilm or on screen. So any theoretical and methodological insights they might have generated remain unseen and even unsuspected. Nor is current research in material culture treated, although much of it undertakes the favoured close reading advocated here, but at the level of issues and runs. Issues (e. g. of Punch, Blackwood's, and Reynolds's Weekly Newspaper) are brands purchased regularly by thousands of readers as well as patronised by advertisers. Their respective mixes of content and its order, price, size and periodicity, all generic markers, are dismissed here on the grounds that only editors and sub-editors take note of the "opaque" composition of issues or runs (157). For Liddle, the literary acts of reading and writing are the factors governing the cultural status of a text, resulting in the privileging of the item level: since the "original writer" of a journalism text is the definitive element, each article s/he writes is allegedly the only unit s/he perceives.
" -especially journalistic ones - only reproduce ready-made meanings already contained in the genre itself....the Victorian repertoire of periodical genres was limited and easy for writers (and many nonwriters) to acquire throughout the century" (my emphasis, 154-55). Unruly journalism will present problems for this model, which is openly recommended here as a means of addressing - and quelling -- the chaos of overabundant journalism texts. Critical debate on this question -- of the units of journalism -- has already started in relation to digital editions. Editors of these must decide how to represent their material: as individual items deracinated from their issues, as issues, or as issues constituting parts of runs that over time change titles, owners, editors, contributors, price, size, and even political affiliation. Recently, the broad diversity of the press in this period has become potentially far more visible and accessible through the online edition of the Waterloo Directory of English Newspapers and Periodicals 1800-1900. Series 2 (2003) with its thumbnails and the electronic publication of a huge array of full-text, searchable titles. 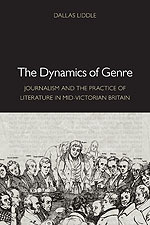 In this context the range of journalism surveyed in The Dynamics of Genre is unaccountably narrow: upmarket London newspapers, quarterlies, magazines, or weeklies, populate citations in this book, and the illustrated press, the comic press, the trade press, the popular press, and the regional press are hardly in evidence. A succession of delimiting and explicit moves here results in a reductive model of journalism for this period. One is insistence on a rigid demarcation between the genres of journalism and literature. It is an incredible claim. Given the incidence of journalism that includes fiction in this period (eg Blackwood's Magazine, the Cornhill, and Household Words), how can we absolutely separate the two? A second delimiting move is the persistent conflation of periodicals and newspapers (cf. 97), as though they belong to the single genre of "journalism," and the concomitant occasional use of the same terms for both periodicals and newspapers. There is no reference to possible generic distinctions among various kinds of periodicals: magazines, newspapers, reviews; dailies, weeklies, monthlies, quarterlies, annuals; the illustrated press, the trade press, the local press. With different relations to time, news, commerce, place, and the profession of journalism, these publications exemplify generic diversity. Equally regrettable is the repeated claim that earlier critics have done no work on press and genre. What about Graham Law's Serializing Fiction in the Victorian Press (2000)? Had this book been read or cited, the allegedly impermeable wall between Literature and Journalism in Victorian England could not have been maintained. Besides Law, a number of related works that undermine this rigid division are similarly neglected: Linda Hughes on poetry and periodicals and newspapers; Kathryn Ledbetter on literature and the annuals; Michael Slater on Dickens's journalism and literature, and on Douglas Jerrold; Thackeray's editors and critics on the relation between his journalism and his fiction; and the ongoing edition of the journalism of Oscar Wilde (edited by John Stokes and Mark Turner ) and its relation, inter alia, to Wilde's fiction and drama. To all this work on the cross-pollination of literature and journalism must now be added Mathew Rubery's new book, The Novelty of Newspapers: Victorian Fiction after the Invention of the News (2009). The complexity of the "review" is also flattened in this book. I have already noted that Liddle makes interesting points about George Eliot's "slasher" reviews. But while Liddle claims that Eliot felt bound--on generic grounds--to attack "Silly Novels" and "The Poet Young" with a discourse of authoritarian certainty, other types of review that Marian Evans might have adapted can readily be found in a range of journals (including the Westminister) in the 1850s, or in articles about comparable reviews at the time. Reviews in this period were generically diverse. While some still largely featured long quotations, others, in the quarterlies, were often lengthy (15-35 pp.) and remarkably open to whatever note (and topic) the contributor sounded and the editor allowed. Evans worked under no generic necessity to 'slash' Young or lady novelists. That there are numerous genres within journalism issues at any given time is not conceded upfront or theoretically in The Dynamics of Genre, although there are frequent references to the review and the leading article as genres. Anonymity, an important element in both, is scantily discussed, nor is it disclosed when an article by Ainsworth is read closely, as though Ainsworth is a recognised authority. That Ainsworth published it anonymously is an aspect of its genre that the readers of this book need to know to assess his article. Moreover, the simplest exercise in perusing single issues of a weekly newspaper (e.g. the Northern Star), a daily paper (eg the Pall Mall Gazette) or a quarterly (e.g. the Westminster Review) in these years reveals a number and diversity of genres within single issues, including leaders and reviews but also, variously, correspondence, news reports, signed columns, announcements, advertisements, occasional paragraphs, resumes, verbatim records (of court and Parliament), Registers, etc. Basic electronic editions of Victorian journalism such as that of The Times have long since provided search categories based on a selection of these genres, and more elaborate projects such as SciPer and ncse include commentary on such matters on their websites. Other points made by this book must be questioned by students of media history. To insist that there were few changes in journalism between 1855 and 1867 ("a pause in the narrative", p. 165) is to miss what happened from 1855 to 1861, when the removal of the newspaper taxes resulted in cheap dailies such as the Telegraph. Meanwhile the sassy Saturday Review revived and rethought the genre of veteran weeklies such as the Athenaeum and the Spectator (both 1828 ff. ), and numerous regional weeklies and bi- and tri- weeklies appeared. In 1859/60, Cornhill and Macmillan's created a fresh genre, the shilling monthlies, which led to imitators and offshoots. In 1865 two new titles experimented with merged genres: a fortnightly review purporting to combine a quarterly, a monthly and a weekly; and an upmarket but cheap evening daily (the Pall Mall Gazette) mixing newspaper and review. Additionally, the attempt to characterise 1855-1867 as dormant years in the history of the press before the real change wrought by New Journalism seems to spring from a conception of journalism as a monologic genre. Although Joel Wiener's 1988 collection Papers for the Millions is cited (209), where it is commonly agreed that the onset of New Journalism occurs long before Matthew Arnold belatedly named it in 1887, this late date is tendered (165) to clinch the claim that "no change" came before it. Genre, the subject of this book, is spot-on for journalism, which, as Liddle avers, is characterised by rapid change. The genres of journalism merit further detailed attention, and Bakhtin's notions of hybridity within discourses and dialogue among them are useful ingredients in such analysis. But although the preponderance of reference here is to journalism, that orientation is hijacked by the book's default platform of Art/ Literature, which puts journalism in the following abject position. Can these generalizations stand? More precisely, can they withstand John North's claims --which The Dynamics of Genres cites (149-49) -- for the number and diversity of nineteenth-century titles? As is evident from North's Waterloo Directory, many periodicals and newspapers were designed for specialist readers, from trade journals to professional transactions; many papers for serials were written very carefully indeed, in the mid-Victorian years, by writers such as John Stuart Mill, Matthew Arnold, George Henry Lewes, W R Greg, Walter Pater and Walter Bagehot. And much of what they wrote for serial publication at this time subsequently appeared with little revision in books. The passage quoted above applies best to daily newspapers and weeklies. Its claims cannot plausibly fit periodicals, and when it uses Arnold's intemperate charges against the new journalism (inaccurate, ignorant, ill-written) to describe all journalism it reveals the High Art/Literature perspective from which it springs. Few scholars of media history or popular culture would view the Times's responsiveness to "shifting political winds" as "notorious" ; rather it is constitutive of the conditions of this class of daily paper at the time. In promptly agreeing that such flexibility may be "key" to journalistic success (165), the passage reveals the deep fissure characterising this book--the gap between its author's expertise and serious interest in journalism and his fealty to the discourses of high culture. It is by now a commonplace that the rise of "English Literature" as an academic subject coincided with the rise of Journalism, and that in the nineteenth century they held a competitive dialogue that was audible in the work of single authors, among critics, and across genres. Nothing new here. Lodged between our own period's version of academic English, which is embroiled in textual and generic hierarchy, and a history of journalism which, like English, is on the move and fragmented, this book seems to revive the angst-ridden discourse of divided loyalties that began in the nineteenth century. Yet many scholars within university English departments no longer believe that all Journalism is generically inferior to Literature, or that either one can be monologically classified. In our time English has expanded to include/appropriate many fields hitherto kept at its borders, while journalism itself is a word whose province has burgeoned. Taking in digital media, video, broadcast media, film, and print, it propels critics and historians into media history. So, we are now learning to talk about "Print Journalism" even as we witness its passing. Liddle's book appears at a time of considerable upheaval and radical developments in the study of the press and the nature and status of English, much of which he has chosen not to address directly. On the other hand, this book helps us to see that the rich work of Bakhtin, read less fundamentally and more collaboratively with other sources of theory such as media history, material culture, and computing and the humanities, has great potential for the "miscellany" of press genres and their interfaces with a range of discourses in and out of literature. Insofar as this analysis of nineteenth-century journalism and literature ponders some of the critical issues of our time and field, it fascinatingly reveals the state we're in. "Authors", "Text", "Literature", "Journalism", "Newspapers", "Periodicals", "genre" and "theory": they are all here, under scrutiny. Laurel Brake is Professor Emerita of Literature and Print Culture, Birkbeck, University of London, Director ncse: Nineteenth-Century Serials Edition, and Co-editor with Marysa Demoor, Dictionary of Nineteenth-Century Journalism. Laurel Brake's well-deserved reputation in periodicals scholarship is built on a seminal monograph (Subjugated Knowledges, 1994), years of work on the online Nineteenth-Century Serials Edition (NCSE), and the new Dictionary of Nineteenth-Century Journalism (2009). It is an indictment of my book that its purpose and literal meaning were not clearer to a scholar of her abilities. After the first two paragraphs of her review, however, which are mostly accurate (except for such loaded words as "only," "exclusively," "rejecting," and "any aspect of"), I am almost unable to recognize my own project in the oddly tendentious account she gives of it. My true position, announced in my title, is that there seems to have been an important and traceable relationship of mutual observation, pressure, influence, and, yes, sometimes ideological opposition between the major genre forms used in Victorian journalism and those used for literary texts. Brake further appears to consider my book an exercise in disciplinary partisanship meant to privilege literature (the "approved category" to which I show "fealty") at the expense of journalism. I am dismayed to have left this impression. I did not aim to read my subject through any lens of disciplinary politics, but to reconstruct some historical relationships between genres as they influenced major literary careers and developments over a dozen years of the Victorian mid-century. When the authors I chose as focal points in that era (such as Harriet Martineau) expressed high opinions of journalism and its forms, I studied their positions and tried to explain and contextualize them; when others (such as Elizabeth Barrett Browning or George Eliot) reported lower opinions, I attempted to explain and contextualize those positions as well. Brake seems determined that only positive opinions of Victorian journalism are acceptable, however, no matter what criteria are used or even if some of the critical evaluations were recorded by acute and qualified observers such as the Brownings. If I had done the years of heroic work Brake has done to recover and disseminate journalistic texts I might feel exactly the same way--but I doubt that such a strong predisposition to defend journalism against any detractor would have helped me write more rigorously about the original dynamics of Victorian print culture. Past these miscues about the book's thesis and overall purpose, the review contains several specific mistakes about particular passages and chapters. I do not claim that Victorian journalism had an "overabundance of text problem." I do claim this is a problem faced by modern scholars of Victorian periodicals, who have to study a corpus estimated to contain 100 times more text than all contemporary Victorian books combined. Brake herself, with her valuable efforts to make some of this volume searchable worldwide through the NCSE, has devoted years to helping to address this problem. I do not advocate an "exclusively generic analysis." The Bakhtinian genre analytic I use is meant to be added to the existing toolbox of literary and historical methods (see page 2). I do not "reject" the theories of Anderson, Habermas, and Bourdieu, which I acknowledge (pages 142-44) to have had value for a range of disciplines. My point is that because these theories were designed to describe the behavior of political actors, not to interpret texts, they are more useful for research questions in the social sciences than for literary and print culture studies. Brake writes that my chapter on Harriet Martineau is "marred by its failure to understand the ubiquity (or power) of anonymity [and] the (high) status of leader writing." Pages 59-60 in that chapter are devoted almost entirely to the high status of newspaper leader-writing. Brake writes that I do not "conced[e] upfront" that there were numerous genres used within journalism at any given time. But she quotes a passage from my book ("repertoire of periodical genres") that demonstrates the opposite. I note the multiplicity of periodical genres many times throughout the text, and especially in the first chapter, which I hope is being reasonably upfront (see pages 14, 15, and 31). Brake writes that my chapter on sensational journalism uses "material previously identified and treated by Richard Altick." I would never minimize my debt to Richard Altick, either as a Victorianist or as a scholar of print culture, but I know of no published treatments by him of the 1868 disappearance of the Rev. Benjamin Speke. If Brake was thinking of Deadly Encounters, the Altick book she mentions at the outset, that work treats only the Murray and Vidil cases of 1861. I did all my own primary research for the Speke chapter. I do not believe that newspaper journalism was "dormant" between 1855 and 1867. I devote much of my Epilogue to arguing the reverse. The phrase she quotes as evidence that I do believe this ("a pause in the narrative") is taken from a passage of exposition of a different position, and I refute it in the next paragraph. Finally, I regret having offended Brake by the rhetorical flourish of calling the experience of reading periodical texts "blurry-eyed." I intended no disrespect for Victorian periodicals, but only to invoke the commonplace that they were often printed on inexpensive paper with inexpensive type, and have long been available to scholars mainly through still lower-resolution reproductions. Microfilm and full-page digital images are wonderful things that have transformed periodicals studies for the better, but no one claims--or I thought no one claimed--that they make for comfortable extended reading. The mild complaint that eyestrain is an occupational hazard of the periodicals scholar was aired as recently as August 2009 at the Minneapolis conference of the Research Society for Victorian Periodicals to an auditorium of seventy such scholars. It drew many sympathetic nods, and not one objection I could see--not even from Brake, who was in the front row. This is obviously not the place to re-argue my entire book. Readers must judge whether it supports its thesis and vindicates its methods, and whether the case studies--I am glad Brake found them interesting--show what I suggest they show. I even have a little hope that Brake herself, if she will reread my book, will find that we agree on more issues than she currently believes. Leave a comment on Laurel Brake's review.